Easy: 10 – 15 miles. This is a leisurely pedal through the Santa Ynez Valley. You will roll past local apple orchards, pastoral farms and picturesque vineyards to Beckmen Vineyard. At the vineyard, you will meander on foot through the vines, as your guide describes the biodynamic farming process and how they turn grapes into wine. The estate vineyard tour concludes with a flight of wines in the tasting room. Afterwards, enjoy a short, easy bike ride back to our store. $135/person, min of 2 riders. This is a leisurely pedal through the Santa Ynez Valley. You will roll past local apple orchards, pastoral farms and picturesque vineyards before olive oil tasting in the quaint town of Los Olivos. This tour visits a lavender farm where you will learn how fresh lavender is pressed into oil. Farm-to-table lunch is sourced from local farmer’s market and served on a beautifully set table in the vineyard followed with wine tasting. $170$145/person, min of 2 riders. 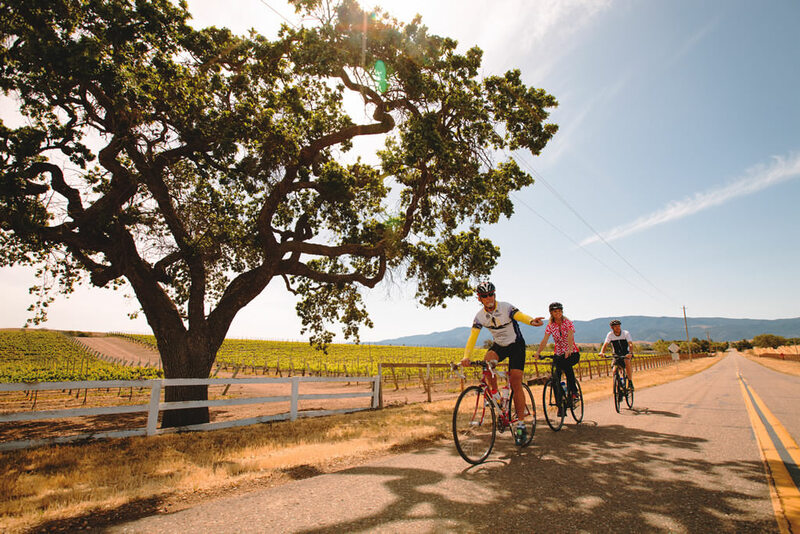 This ride takes you through the heart of the Santa Ynez Valley wine country, past a miniature horse pasture, apple orchards, an old school house and includes olive oil tasting in Los Olivos. Our signature lunch is served at Rusack Vineyard before pedaling through the beautiful Ballard Canyon past vineyards en route back to Solvang. Easy to moderate: 15-20 miles, options for additional mileage. This ride showcases some of the best scenery in the Santa Barbara Wine Country. 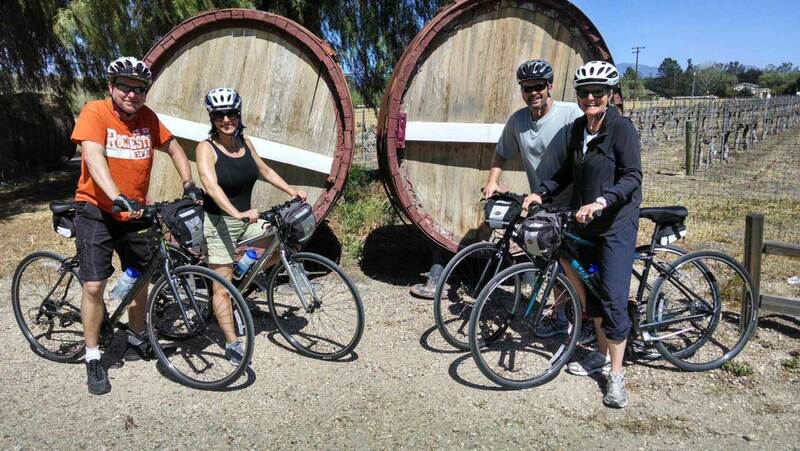 Our high quality, easy to ride electric-assist bicycles makes cycling the wine country accessible to everyone. This spectacular ride takes you through picturesque landscapes, sun-draped vineyards, and oak-studded rolling hills. These beloved back country roads are a perfect example of why the Santa Ynez Valley has become a world-class cycling destination. Our signature farm-to-table lunch is served on a beautifully set table at Bridlewood Winery with wine tasting in the estate’s tasting room to follow. Cycle through the heart of the Santa Ynez Valley with frequent stops at some of our favorite local spots including Clairmont Lavender Farms to learn how fresh lavender is pressed into oil and a local olive oil tasting room. We will also stop at Dragonette cellars for wine tasting and Strafford’s Fine Chocolates for chocolate tastings in lieu of our signature lunch. The recommended start to this tour is 11:00am. Please note that Staffords Chocolates is closed every Tuesday and Wednesday. Any tours booked on these days will include a second tasting in place of the chocolate tasting. No lunch $110/person, min of 2 riders. 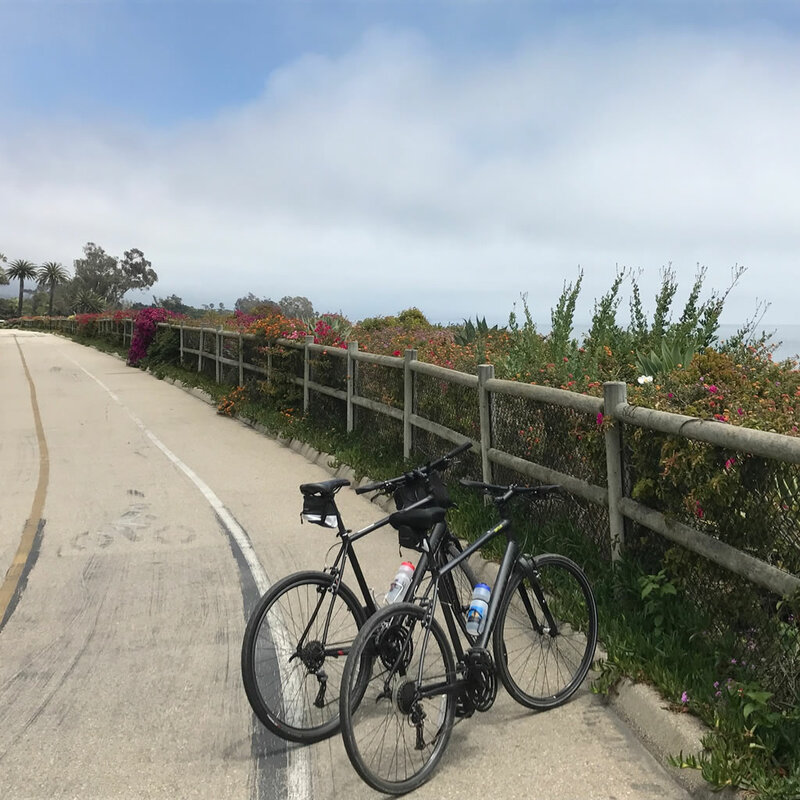 This route predominately travels the bike paths along the beaches between Santa Barbara and Summerland. It begins on the bluffs of Leadbetter beach, passes the stunning landscapes of the Four Seasons Hotel, the Music Academy of the West and the Andree Clark Bird Refuge. This is a mostly flat course with some gentle hills; comfortable shoulders and Class 2 bike lanes round out what is otherwise, a beach cruise. The views are what make this tour unique. Santa Barbara is known as America’s Riveria because of it’s breath-taking ocean views and also the temperate climate which allows for botanical diversity and vibrant colors seldom seen elsewhere. The shoreline properties have been carefully cultivated for generations allowing for older specimens making this a tour sure to delight cyclists who appreciate views of the ocean and gardens. Lunch at the Garden Market in Carpentaria is served in a courtyard garden a stone’s throw from the beach. $200/person, min of 2 riders. Includes option for hotel pickup.